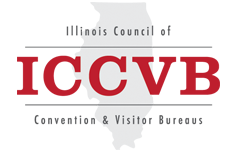 What is the Illinois Council of Convention & Visitor Bureaus (ICCVB)? The mission of ICCVB is to enable the members to be more effective and more efficient in attracting visitors to their communities by providing educational opportunities which raises the level of professionalism in the travel industry and provides a forum for networking and cooperative action between the members. Our purpose is to provide a forum for the exchange of information between members and provide opportunities for cooperative action which will enhance the growth of the travel industry in Illinois. Please scroll down to learn what we do, what we provide, and types of membership available. Note on Membership: If you are a Regular or Affiliated member and would like to add additional personnel from your company as Employee Members, please contact ICCVB headquarters. You can download and return this convenient Word form, or e-mail the names, titles, e-mails and other contact information of these employees to [email protected]. Be sure to include whether or not you would like these individuals to receive information related to our Niche Committees: F&A, Market Illinois, Meet in Illinois, Sports Illinois, or Tour Illinois. Additionally, if you would like to check and see who from your company is already listed, you can do a search in the Membership Directory (located in the Member Center), or contact ICCVB at 630-359-4273. Regular – Must be a certified CVB in Illinois. Membership is with the organization and the CEO is listed as the primary contact. Additional personnel may be added as Regular Member Employees at no additional cost. Annual dues are based on your total annual budget, including state grant. Affiliated – Must be a non-certified CVB, or an RTDO in Illinois. Membership is with the organization and the CEO is listed as the primary contact. Additional personnel may be added as Affiliated Member Employees at no additional cost. Annual dues are based on your total annual budget. If you are interested in joining, please contact our office, [email protected] or 630-359-4273 for a dues schedule and membership application.